Ever since I became a Guide dog owner nearly 8 years ago now I’ve dealt with all kinds of different reactions from people good and bad and even when I spent time in a wheelchair when I was 15 and I guess it comes with being disabled or simply just different. People have different views and perceptions about people with disabilities and I find it quite interesting, sometimes frustrating and intriguing how people come to have these reactions. One of the main reactions is “you’re an inspiration”. A lot of disabled people find this patronising and I used to think why on earth am I an inspiration, I’m just living the life I was given but now I’ve come to the conclusion that’s it’s not a bad thing and if I inspire one person to do something or achieve something that they thought they couldn’t or even just getting them to realise that they may be struggling with the slightest thing and I walk past with my dog and they say “you’re an inspiration”, they may just need that little bit of encouragement. I believe whoever we meet on a daily basis we are meant to cross paths. I say to my friends who deal with and have overcome challenges that they are an inspiration because for instance 2 of my friends and I’m sure they both won’t mind me saying have both gone from having some sight to having nothing at all and I see them both as an inspiration for having had the strength to get through that particular challenge because to be perfectly honest I don’t know if I could. Everyone has challenges to deal with and for the public to see someone in a worse situation to themselves just walking down the street with an assistance dog or shopping but happen to be in a wheelchair or on crutches, are deaf or limited mobility will encourage some people. When we talk to people they are interested and just want to know more, sometimes conversations get to the point where i open up and feel able to tell them about my disabilities and that can then create this reaction. When I tell people I have CP they can’t believe it, I tell them I was in a wheelchair for a while, I tell them how I came to get a guide dog if they want to know and that inspires them. Some people can’t believe young people can be disabled, I had one lady say “your too young to be blind” I said it can happen to anyone at any point in life and that was her educated, she felt sympathy for me, I don’t want that and I don’t need it, empathy fine but I don’t need feeling sorry for but inspiring people is encouraging them. I don’t necessarily see myself as an inspiration but I know people do see me as an inspiration, what makes them say or think that word is not for me to judge, if I inspire them in some way then that’s absolutely fine and I certainly take it as a compliment. Watching the Paralympics there were ladies with CP running & cycling, VIs swimming and disabled equestrians and to me they are inspirational and they have inspired me to get into a sport I have always loved but never been able to progress (Horse riding) so they have encouraged me to do something because I thought if they can do it what’s my excuse. Yes we can’t do everything, we all have limitations which we need to realise and nobody must ever feel bad for not feeling able to do something or simply not being able to because we are all different and we all have different motivations, interests and hobbies. Everyone at times will feel negative, when I had to give up VI tennis because it was too much on my muscles and joints I felt angry and upset at myself and I felt like I had failed but now I think I tried it, it wasn’t for me and I then tried to find something else I could do and when adaptive skiing was opened up I took up the opportunity and with the help of my fabulous ski instructor I’ve succeeded, again it hasn’t been easy but it’s something I enjoy. I can’t do it whilst in Devon because there isn’t the opportunity here so now I really hope to succeed in horse riding. 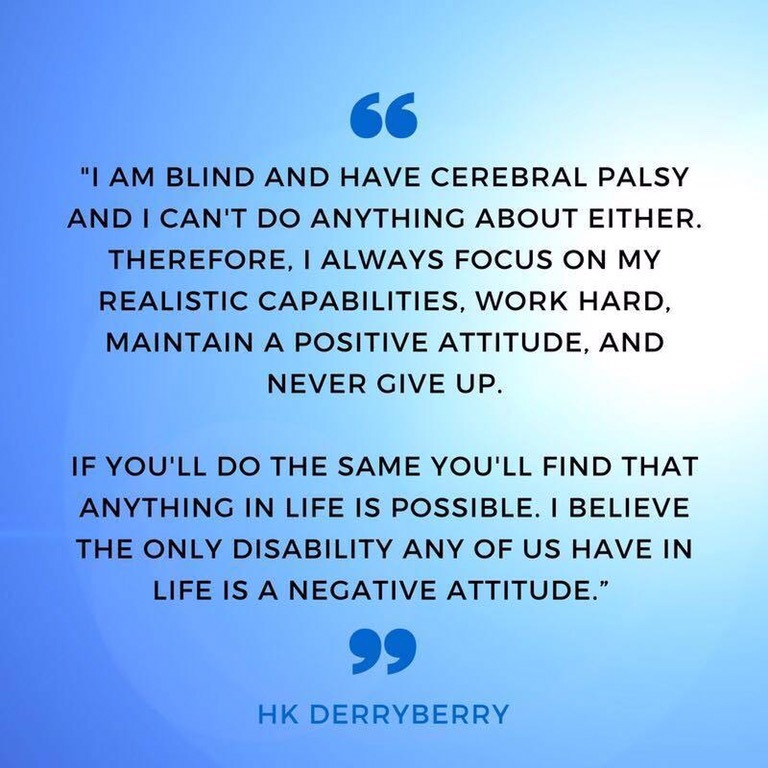 Now again some people think quotes like this one: “The only disability in life is a negative attitude” are aimed at them. The way I look at it is: Nobody can do anything about their personal limitations but everyone can change their attitude so for instance trying to see the positives in every situation. Of course we all have down days where we feel we’ve had enough and a negative attitude gets the better of us and that’s fine but maybe we need to especially on days like this when we feel hopeless, set ourselves a challenge to just find one positive thing about that day, it will make us feel that little bit happier. I don’t believe anything in life is possible, within reason or a person’s capabilities but I don’t believe in can’t and a “can do attitude” is very important because we will achieve what we want to if we say I CAN and do it :). Quote says: “I am blind and have Cerebral Palsy and I can’t do anything about either. Therefore, I always focus on my realistic capabilities, work hard, maintain a positive attitude, and never give up.